Find John Young websites, mailing lists, chat rooms, and other music links here! We specialize in progressive rock, progressive metal, 80s rock, 80s metal, 80s new wave, melodic rock, AOR, and more! Although you may not have heard of John Young, you've probably heard him without realizing it. 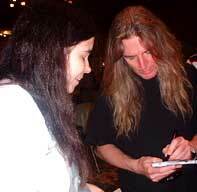 He plays keyboards and sings for The Scorpions, Bonnie Tyler, Greenslade and the John Young Band. He also has done work with such artists as Asia, John Wetton, Fish, Paul Rodgers, Qango, Uli Jon Roth, Roy Wood, George & Ringo, Jimmy Page and Robert Plant, Bon Jovi, E.L.O., The Moody Blues, Wishbone Ash, Van Morrison, and many more. He's also a great songwriter, who has written songs for John Wetton, Fish, and his own band, as well as for C.N.N., the BBC, ITV, C4, Discovery Channel, History, National Geographic, and more. I saw him play a few years ago at the John Wetton Fan Convention, and I highly recommend him to anyone who is a fan of John Wetton's solo music, since you can definitely hear his influence on that. Official Site. Run by Artist. The band has contributed to this site. Photos, Merchandise Info, Links, Blog. This MySpace is limited to people who actually own one of his or his band's cds. Official Site. Run by Artist. The band has contributed to this site. Photos, Sound Files, Merchandise Info, Links. This MySpace focuses on his electronica music. Official Site. Run by Artist. The band has contributed to this site. Photos, Sound Files, Merchandise Info, Links. This MySpace seems to focus on his Indian Summer album. Official Site. Run by Artist. The band has contributed to this site. News, Bio, Photos, Sound Files, Links, Blog. This MySpace focuses on his Classical music and influences. Official Site. Run by Artist. The band has contributed to this site. News, Photos, Merchandise Info, Links, Sound Files, Blog. This MySpace focuses on his ambient music. Official Site. Run by Artist. The band has contributed to this site. News, Photos, Links, Sound Files, Blog. This MySpace is to get fans involved in promoting his music. Official Site. Run by Artist. The band has contributed to this site. News, Tour Dates, Bio, Sound Files, Merchandise Info, Blog. Official Site. Run by Artist. The band has contributed to this site. News, Tour Dates, Discography, Photos, Merchandise Info, Guest Book, E-mail Address, Links. Bio, Reviews, Sound Files, Merchandise Info. The band has contributed to this site. News, Tour Dates, Forums. Official announcements only list. To subscribe, follow the link above or e-mail jynewsletter-subscribe@yahoogroups.com.